Your child will be over the moon with this Chad Valley Designafriend Glamping Set, which comes with two pillows, two (2) flower-patterned zip-up sleeping bags which compliment the glamourous pink, grey and white coloured tent which also has a pretty flower pattern, a bunting trim and a curtain opening with ribbon tie-backs. Great addition to the DesignaFriend collection, fantastic for stimulating creative storytelling. Size H75, W67.4, D67.4cm. 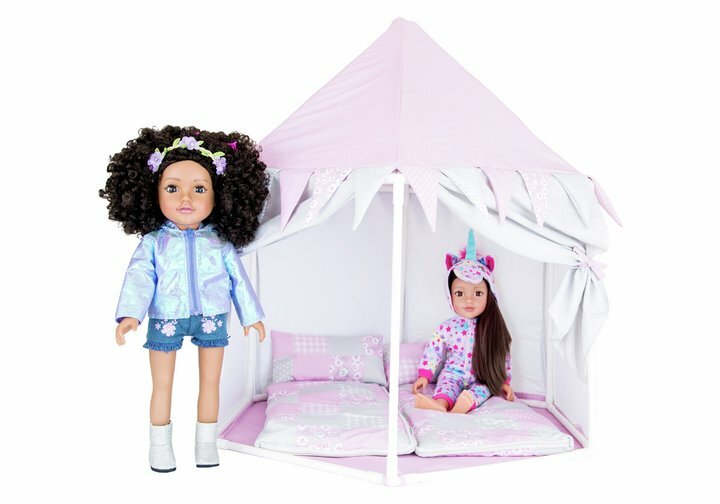 Get money off with April 2019 free Argos voucher codes, see if there's a discount code for the Chad Valley Designafriend Glamping Set product. 4.8/5 from 13 recent reviews.